One of the many battle that British and Americans fought, was the Battle of Bunker Hill. Lord William Howe, the British Commander had underestimated the Continental army. He thought that they were just as all the other European armies. That they marched in order, alligned themselves in a compact and organized group, and started shooting at the enemy, but he was wrong. 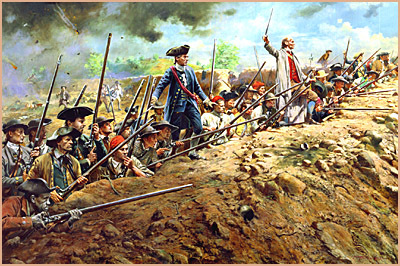 Unlike the Europeans, the Patriots were fighting for their freedom, for their families, for their country. They fought with all their courage to defend what they loved, while the Europeans fought for a king. A king they rarely saw, a king who levied taxes on them, but let the aristocrats live their luxurious life without paying a penny for taxes. And normally Europeans wars were fought to expand their territory, the soldiers normally had no huge motivation to fight in a war, and would normally flee if their life was endangered greatfully. But the fact that Americans were fighting to protect their lives and liberty, made them not fear the fact of dying during a fight, and they were disposed to win the war, by any means necessary. Lord Howe commits all the possible mistakes a general can make during a battle. He orders his red coats to march uphill ( remember the red coats, besides wearing red which is a very notorious color, are carrying heavy equipment) and make a frontal assault during the middle of the day. While the Patriots, under the command of General Putnam and Major William Prescott, were hiding on trenches, behind trees, and stone walls, just waiting eagerly to ambush the British troops. “Don’t shoot until you see the whites of their eyes!” – General Putnam ordering his troops. General Howe, sent his troops straight to a rain of fire and death. He wanted his army to win, even though he gave the Americans all posible advantages. He thought that no matter what his experienced army of red coats faced, they would never be defeated by a rabble of insubordinate colonists. But what he didn’t know was that he was only able to win this battle, because colonists ran out of ammunitions, and had to retreat. But the damage was already done, and many red coats died this day. 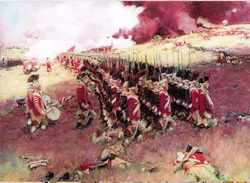 The British may have won the battle in physical terms, but the Americans had built up momentum and spirit with the huge amount of red coats they killed and not only that, but they won the battle psychologically.